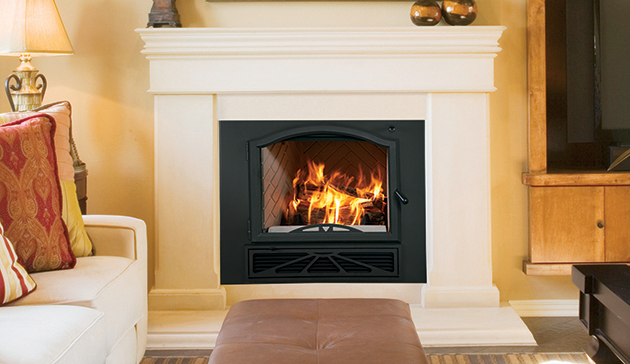 With superior heat output and high-efficiency operation, the WRT4826 wood-burning fireplace excels. It’s the ideal option for large spaces, heating up to 2,500 sq. ft.* with catalytic technology that achieves more than 75% efficiency. It also meets EPA Phase II emission standards for clean, environmentally responsible burning. Its tall and expansive size features a single door that provides an unobstructed viewing area. Plus, the Panorama offers premium accessories to complement its impressive stature. The design of the WRT4826 is an inspirational balance of form and function. Single door (European-style cast-iron) design provides a tall opening for an unobstructed panoramic view of the fire. Catalytic technolgy achieves more than 75% burning efficiency for up to eight hours of burn time – resulting in fuel savings. EPA Phase II-certified performance achieves compliance for federal government emission standards. Powerful blower circulates heat in large spaces or multiple rooms up to 2,500 sq. ft. Ceramic glass for safety and optimum heat transfer. Airtight combustion chamber for maximum efficiency and highest heat output. Efficient air wash system keeps viewing glass clean. Decorate distinctively with a variety of optional face and base plate designs. Decorative cast-iron log retainer provides an upscale touch.